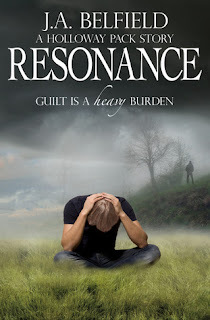 I am so excited I got to be part of the Resonance blog tour! I will share my review with you (again). Blurb from Goodreads: Guilt is a heavy burden for the one carrying it. This is a short story, but it doens’t feel like one. It continues right after were Blue Moon ended. The story continues and I read it in one sitting, because I had to know what happened. Eevery book in this series is even better than the last one and I can’t wait to read what this author writes next! Normally I don’t like short stories, because they have that distinctive short story feel, there just isn’t enough story and it feels rushed. Resonance wasn’t like that at all, it felt like I just started a new book, okay it was shorter than a normal book, but the writing style felt just like it was a book. I really love how this author has the ability to write short stories, that don’t feel like short stories. I liked where the story took us and was surprised at how some things turned out. And the ending was awesome and makes me want to read the next book! There isn’t much room for world building and character development in such a short story, but the author still managed to put in a little of both. We learn some new things about the world, that surprised me. Also we get to see more intereactions between Jem and Sean and how they deal with the situation. To conclude: I really enjoyed this and how it didn’t feel like a short story at all. I liked that the author managed to even include a bit world building and character development. And after reading this I am even more looking forward to the next book. – At which point in your life did you decide to become a writer? – How did you come up with the idea for the Holloway Pack series? I didn’t really. I came up with the idea of Darkness & Light whilst writing a rubbish werewolf trilogy. The name Sean invaded my head like a cattle prod, and then came random scenes like the meeting in the burger bar, and the biting of Jem in her dreams, and I kinda strung enough thoughts together to make those into Darkness & Light. Then once I’d finished writing that one, I decided I missed working with Jem and Sean and Blue Moon was born, as well as Instinct. It was only when I started on Caged, I recognized the potential for a series. – How many books did you plan initially? – How many books have you planned in this series now? – Why did you want to write a book about werewolves? They intrigue me. The possibilities of regular humans with animal instincts, and the ability to become that animal to heighten awareness … muchero coolness. – I think the Holloway Pack series can be best described as Paranormal Romance. What attracts you to this genre and why did you decide to write a series in this genre? I don’t tend to choose to write in a particular genre. I merely tell the story that’s in my head, and then afterward try to figure out which genre it falls into. Writing to a formula, or to specific needs/rules/guidelines, whatever, doesn’t suit me. It kills me that I now have to cap my word counts. I used to just roam free and go wild and let the story be what it wants—but my publisher has a limit on accepted length so I have to attempt to adhere to that. Random fact: First ever draft of Darkness & Light ended up as 161000 words. And a few questions about Ja Belfields daily life and writing habits. – Can you tell me a bit about what a normal day in your life is like? Define normal … LOL. I get up, sort the kids out for school, read my emails, do my social media checks, send the kids out the door, read some of whatever book I’m reading over breakfast, get all the niggly jobs out of the way before doing what I have planned for the day—be it blog posts, adding to a WIP, organizing a blog tour … and amongst all that remember to eat again. Most days, the kids come home before I notice the time, and I’m still sitting where they left me. Then Mr B comes home and I’m still sitting there, and we have the discussion about what’s for dinner because no way will I have remembered to organize something to eat, and it usually ends up with him cooking whilst I watch, hehehe. If I’m lucky, I’m off the laptop by mid-evening, and I spend the rest of the day’s hours chilling with Mr B, either watching TV or heading out for a walk somewhere. – What is your favorite thing to drink during writing? Coffee in the a.m.; very weakly diluted squash in the p.m.
– What is your favorite food/snack during writing? Whatever’s nearest and requires the least preparation. – Do you have any writing habits? – What is the best thing about being an author? Getting to convince people that daydreaming is your job. Isn’t it awesome to know that this series started out as a stand-alone and now has 6 books planned? I really enjoyed this interview and reading the responses to my questions! – send in a picture of you and Blue Moon (this can be a hardcopy or the cover on your e-reader/tablet, but no pdf files allowed). – send in the link to where you posted your review of Blue Moon (this review has to be 100 words at least and it doens’t matter where you posted it). 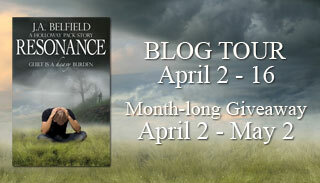 I am glad I could be part of the Resonance blog tour! And thanks for answering all my questions! Really cool blog stop Lola. I really need to get around to reading this series I swear. I here so many great things about it. I think the first book of this series is just okay, so even if you don’t like that one make sure to read the second book. From then on it starts to get really good and all the short stories are also worth reading!